In my trip to Helsinki there was a curly place called Piritanaukio which should mean Pirita square and that's what it looks like, a square. Pirita is certainly taken from Tallinn's Pirita region and based on its history -- Pirita is estonianised version of Swedish Birgitta -- the next street over there is called Birgittalaiskatu and Birgittalaiskuja. Also, Luostaripuisto (Convent park) and Pyhän Birgitan Puisto (Holy Bridget Park) are right there. So all related to Swedish Birgitta. Here are photos of this square and views around it. 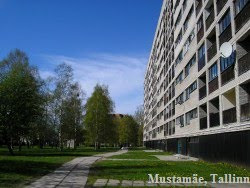 In Tallinn, a similar area with only three houses, probably taller, is at Tuvi street right next to National Library.